I have been strangely obsessed with clouds lately. I know! It's weird. Clouds are clouds, right? But for some reason, I keep noticing how beautiful they are. I never used to notice them at all, really. I mean, sunsets--sure, but just everyday clouds? Nah. All that has changed. Every day is "Cloud Appreciation Day" around here--at least for me. I think my family might be getting tired of me exclaiming--"Those clouds are so pretty!" almost every time I go outside. It's the worst when I'm driving, because I want to look at the clouds instead of watching the road. Head in the clouds? Yeah. Literally. With all the rain we've had for the last several weeks, I've had lots of chances to admire them in many varieties. 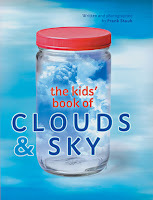 I figured while I was at it, I may as well find some books about clouds to read with my kids, because nothing feeds an obsession like reading more about it. Yes! Also, it might be nice to go beyond: "Oooh, look at the pretty clouds," to actually knowing what types they are and stuff. (No, that is not Big Anthony on the cover.) 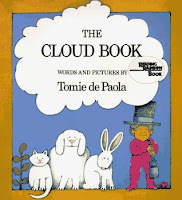 De Paola discusses the 10 most common types of clouds, with cleverly drawn illustrations to make his point. He also mentions various cloud-related legends, and weather/cloud related sayings. This one was checked out when I went to gather my books, but it looked so good from the description that I decided to wait for it to come back. I'm glad I did! 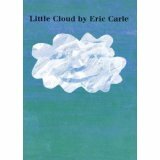 Informative, with humorous pictures, and even a short & silly cloud story at the very end. This is one I could see owning. 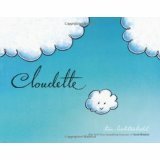 Cloudette is a very small cloud. She really likes it, most of the time, except when all the big clouds rush off to do something important. She wants to help too, but there's no job just right for a cloud her size. Then one day she gets blown out of her usual neighborhood, and finds a frog that could really use her help. The best part of this one was all the side comments on every page. Expressive illustrations, and a little cloud with big dreams. Loved it! What can those shapes be? "It looked like a bird, but it wasn't a bird..."
A classic; with a refrain on almost every page that makes it great for early readers. Little Cloud changes into lots of different shapes, before joining the big clouds and raining. 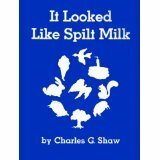 This one is a lot like It Looked Like Spilt Milk, but it's not set up as a guessing game. Simple text, with Carle's signature painted/cut-paper illustrations. 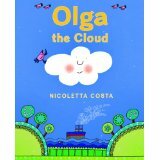 Olga is another little cloud, who just wants to rain on something! Everyone chases her away, until finally Gino the bird shows her just where to go to make some rain. 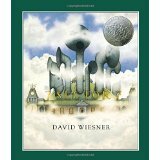 Wordless story of a boy who makes friends with a cloud and gets a ride to the cloud factory. So many details on every page! A book to savor. Magical and fun! This was actually my first exposure to this Caldecott Honor winner. I can tell I need to seek out more of these wordless picture books--my kids didn't really know what to do with it when I brought it home. 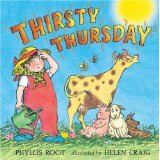 Every person, animal, and plant on Bonnie Bumble's farm is suffering for a drink. Just when they think they can't take it anymore, a little cloud comes along. Bonnie knows just what to do to tickle that cloud into raining. Clever wordplay with a very satisfying conclusion. This one's a winner! 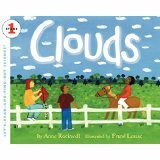 Very simple text, with paintings of the different types of clouds. It goes into the 3 layers of clouds, highest to lowest. After a brief overview of that layer, each type of cloud then gets a paragraph-long explanation with further details, including what type of weather to expect when you see those particular clouds. 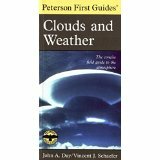 Great basic introduction to clouds and weather. One full sentence per 4 pages, in large type, with gorgeous full-color photo spreads at every page turn. The back of the book has lesson-extending material, such as science experiments, a matching game, and a page about predicting the weather. With its brevity, this one could even be used with preschool-aged children. Written in a question-answer format, this one would be perfect for a child giving a report, or to pick and choose questions of most interest. Answers are given over 1-2 pages, with at least 1 color photo accompanying them to illustrate. Many whole pages are filled with captioned photographs. Questions cover everything from "Where does the wind come from?" to "Why is the moon white, and why does it look so big?" So while it does cover clouds, it also ranges much further than the other books. Answers are written in accessible, conversational style. Several pages also include experiments to do at home. The book also includes a Table of Contents listing every question, plus a Glossary and an Index in the back. I'm fascinated (surprise, surprise)! Just paging through, I stopped to read several of the questions and answers. In case you aren't already impressed by Staub, he took all the photos for the book himself. [He wins the Awesome prize!] I plan to let my kiddos take turns choosing a question, then reading the answer together. This would be another great one to own, just for when curiosity strikes. Hmm...my birthday is coming up! One of the strengths of this book is its size: at just 6x3 inches (tall/wide), it is just right for slipping into a backpack for a hike. 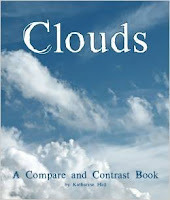 After the introduction, each type of cloud gets a 2-page spread, with 1-3 paragraphs of information about it and captioned color photos. It also covers Unusual Clouds, Color in the Sky, Precipitation & the Water Cycle, Weather Forecasting, and more. This one would probably be most helpful for grades 4 and up, based on vocabulary and length of text. 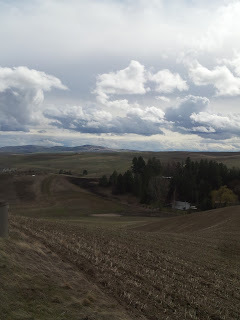 The photos could be enjoyed or used by a wider range of ages trying to pick out what type of cloud is up there. Do you have any favorite books about clouds? Or pretty cloud photos you want to share with me? I will be a very appreciate audience, pinky promise! This post is linked up with Literacy Musing Mondays. Stop by there for some more reading-related inspiration! What a great grouping of books! Thanks for sharing! Thanks, Beth! I'm glad you stopped by.